Dimensions: 4 feet x 6 feet x 5 feet. Capacity: Can hold approximately 30 bags of trash. Weight Limit: Typically can store up to 800 pounds of material. However, hazardous materials and certain bulk items cannot be placed inside these bins. This includes batteries, infectious waste, asbestos, heavy materials (concrete, asphalt, lumber, roofing shingles, block and dirt) and industrial waste. 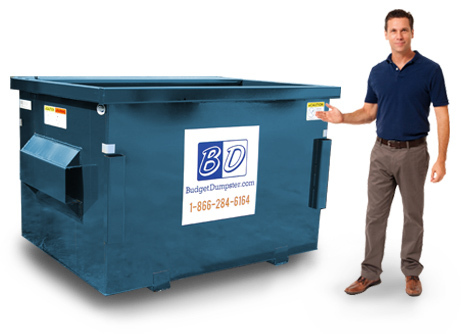 These dumpsters are an all-around good choice for any small to medium-sized business. It offers more value for businesses that might be considering a 2 yard dumpster rental, but feel they are likely to exceed that capacity during any given week, prompting an additional pickup (and charge). For those businesses, it is far more economical to rent a 4 yard dumpster than to constantly order a second trash pickup every week. There are many types of businesses that would be well-suited with a 4 yard dumpster. Wholesalers with less than 5,000 square feet of space. What is the Best Location for a 4 Yard Dumpster? Most commercial enterprises that use a 4 yard dumpster keep it either a designated parking area or a separate corral to keep passersby from going through it. If you run a restaurant, the best place to keep the dumpster is right by the back door so your employees can easily toss out the garbage as it starts to pile up during the Friday night dinner rush. If you manage a commercial property, then you will probably want to keep your dumpster by the loading area where there is generally enough room for large commercial vehicles. However, if your building receives a lot of orders during business hours, then you might want to consider keeping the dumpster in a separate area where it will be out of the way of delivery trucks.